Expanding on the success of the L Series mixers, Samson has created the L2000, a 20-channel/4-bus professional mixing console. 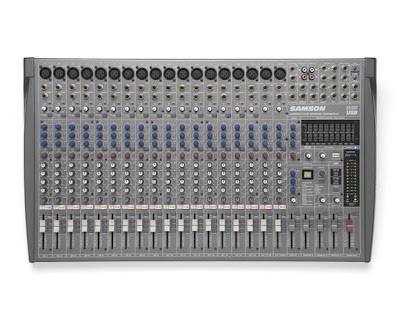 Ideal for small and medium size venues and applications of varying sizes where you still want all the comprehensive, professional features of a large console, the L2000 bridges the gap between size and functionality. Perfect for installation purposes or as a portable mixer for gigging bands, the L2000 provides 16 mono mic/line channels with studio-quality microphone preamps and 3-band swept mid EQ. In addition, the console features 2 stereo line channels with mic preamps and 4-band EQ, along with 3 aux sends plus an EFX send. The L2000 also offers XLR and 1/4-inch stereo main outputs as well as insert points for mono mic/line inputs, group outputs and stereo main outputs. We've designed large, backlit mute buttons that make console navigation in dimly lit club and theater settings easy and convenient. Additionally, there's two large 12-segment LED meters for the main mix and PFL/Solo. We even gave these mixers the versatility to create a variety of effects settings so you can deliver a different set of effects to your performers whenever the situation demands it. Combine all this with a 9-band stereo graphic EQ on the master output and you've got big console performance in a small console package. Like the larger L Series consoles, the L2000 includes USB functionality for computer recording and playback. And while there are more than a few mixing consoles with USB, the L2000 offers the capabilities to build a completely independent stereo mix specifically for your USB digital I/O. That means that-unlike many other mixers-your USB mix is not locked into your house mix. You can even use background tracks pre-recorded on a DAW and integrate them into the live performance directly from your computer. With everything you need to take a live performance to the next level, the L2000 puts the control in your hands and professionalism at your fingertips.